Hi all! It’s good to be back! As we have seen in our last post, we can easily extract all existing metadata information from any number of planning applications, but what can we do with all this information? Well, we can do a lot of great stuff. One of them, as mentioned in the last post, is to compare the existing metadata information to the new metadata that we will load to planning and load just what have changed. This will be covered in details in a later post. Today I’ll be talking about a simpler but very powerful usage of this existing metadata information: metadata validation when loading data to Hyperion Planning! This error happens when you are trying to send data using a member that is not part of your outline. ODI is great to load data into Hyperion Planning, but it has a weird behavior when you have an unknown member in you data load. In a perfect world, ODI reads its source database, gets a big chunk of data and sends straight to Essbase. 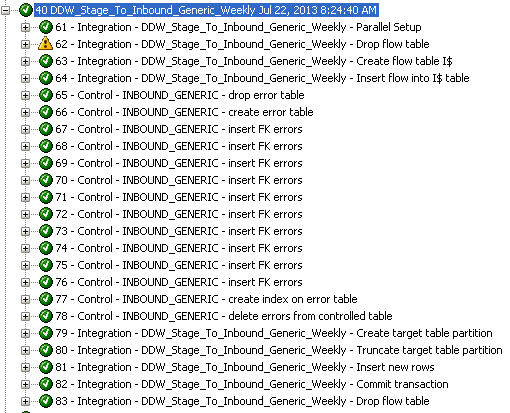 Essbase process it, sends and OK to ODI and ODI sends another big chunk of data. This works pretty fast because it loads big chunks of data at a time, but if you have an unknown member in the data load, Essbase will send to ODI an error stating that there is one unknown member in that data chunk and ODI will switch to “record by record” mode. In this mode ODI will not send a chunk of data but it will send record by record to Essbase and this may take forever depending on how much data you have to load. I don’t really know why ODI behaves like this, but this is what happens in reality. To avoid that we have a very powerfull technique that we will always talk about: metadata from planning repository. We already know how to read all existing metadata from a Planning application, so it is just a matter to compare all members that we will be sending to Hyperion Planning against all existing metadata in that application prior to the load. This will guarantee that only existing members of that application will be sent to Essbase, insuring that ODI will not flip to “record by record” mode. How can we accomplish that? We have a lot of possibilities as it depends on the current database structure and tables that your system has, but I will display one that is generic enough to be applicable to any system. You may want to add more columns to this table if you need, but those should be fine for our example. This table is used to store all existing metadata from any number of Hyperion Planning applications that you may have. You may populate it using the techniques seen in our last post. Why do we need to create this table? As I said, there are many ways to do this verification and maybe you may not need to create it, but I strongly recommend doing so. 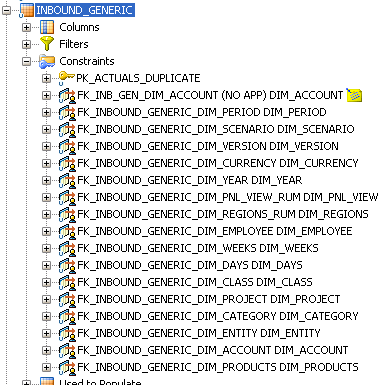 The reason is that you create a data layer between your source system and Hyperion Planning that is centralized in one single point where you can have data for all applications that you may have (you may partition this table by app for example) and you may add centralized ODI check constraints in one single table as we can see below. Go to INBOUND_GENERIC model in ODI and add a New Reference constraint. 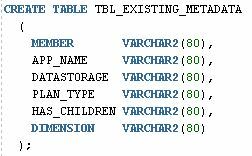 Change the type to “Complex user reference” and select your model that contains the TBL_EXISTING_METADATA table. 4) The last part is just a matter to select a CKM in your ODI interface that will load the INBOUND_GENERIC table and see the results. 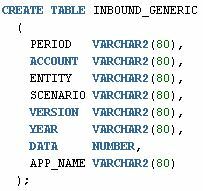 You will have INBOUND_GENERIC table with only metadata that exists in your Hyperion Planning application and an E$ table (created by ODI CKM) with all non-existing members in your outline! Now you may load from INBOUND_GENERIC table to Hyperion Planning application with the guarantee that it will always run fast without worrying about unknown members in your outline. Also as a bonus, you have E$ table with all members that are missing in the outline, so you may use it to warn the end users/support team and so on.